• Configures to any microfinance institution with minimal customization, and manages loans according to an institution’s circumstances. • Adapts to the MFI as it grows and changes its loan products and processes. • Provides simplified navigation and reduced transaction time through an intuitive interface. 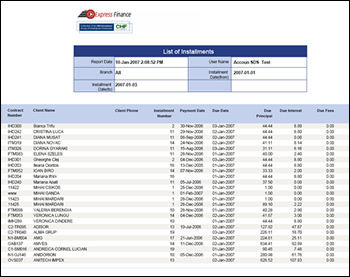 • Strong audit trail offers complete tracking of transactions, reducing mistakes and potential fraud. • Generates effective and timely reports to various end users. • Identifies issues and concerns requiring management attention. • Increased security and data integrity. • Intuitive interface and online help.